Thompson Boxing Promotions had their last show of 2017, New Blood, held at the Doubletree Hotel in Ontario, CA. 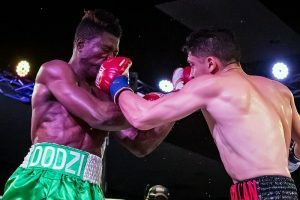 We saw a good card of seven fights, headlined by Giovani “El Gallo de Oro” Santillan (23-0, 13 KOs) going up against Dodzi “The Lion” Kemeh (12-2, 12 KOs). 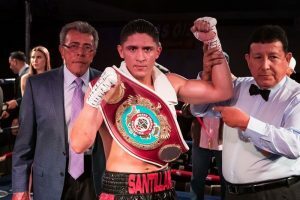 Santillan was defending his WBO NABO welterweight title, and the fight was to go a scheduled 10 rounds. Santillan scored first, as he came out and went right to work on his opponent. At the same time he was measured and patient. They traded blows in the second, but a couple of times Giovani really seemed to rock Kemeh. In the third, while Santillan was still landing, Dodzi was not just going to stand there in front of him. He began to fight back and was able to connect with his punches on Giovani. 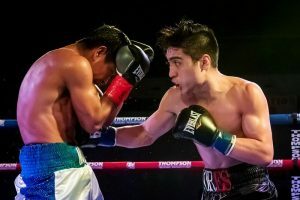 But Santillan came to life again in the fourth, and he was able to hit Kemeh with many solid right hands. 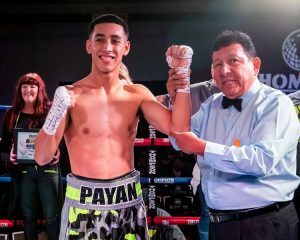 At the end of the round however, due to the recommendation of the ringside physician, the fight was stopped, giving the victory and the title to Santillan. Many fans booed, not because they did not want Giovani to win, but because they felt the stoppage was premature, as did – no surprise – the corner of Kemeh. They were quite upset with that decision. 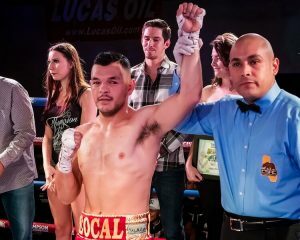 In the co-main event, Erick “The All American Boy” Ituarte (19-1-1, 3 KOs) went up against Gustavo Molina (15-17, 5 KOs) in a fight scheduled for eight rounds in the featherweight division. Ituarte came out swinging, and connecting. He landed some very punishing body shots, so punishing that when he then started going to the head of Molina, Gustavo could not defend himself. He never went down, but referee Raul Caiz, Jr. waved the fight off 2:52 of the very first round. In a junior welterweight bout that was scheduled for eight rounds, Manuel Mendez (15-2-3, 11 KOs) took on Abraham Cordero (13-3-2, 7 KOs). We saw a good round from both fighters, as they were able to land punches while at the same time feeling each other out. The second round had a lot of action, with the larger percentage of that coming from Mendez. He showed off his quick hands in this round. In the third, and especially in the fourth round, Manuel was really finding a home fro his right hand, and seemed to be able to hit Cordero with it at will. That assault continued into fifth, although Abraham was able to land some good body shots. The bad news was, they seemed to have little effect on his opponent. Still, he was landing them. Manuel used some body shots of his own in the sixth, and then he would go upstairs. Cordero had what was probably his best round in the seventh. Not that he didn’t get hit mind you, but he did launch a bit of a rally throughout most of the round. We moved into the eighth and final. The last round provided a lot of action from both men. Abraham really woke up in the last two rounds, but the fight had to be considered a close one. We went to the scorecards, which proved that fact. The judges had it 76-76 twice, and 77-75. The fight was considered a majority draw. 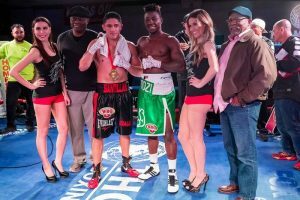 Mario Hernandez (4-0, 1 KO) looked to add another victory to his win streak when he faced off against David Martino (4-4, 4 KOs). This was scheduled for four rounds in the bantamweight division. We saw a very tough and competitive round in the first. While Hernandez had won all of his bouts to date, Martino, while he had lost three, had also won all four of his by knockout, and Mario did feel some of his power. But in round two, Hernandez unleashed his own strength, and absolutely over-powered David. He battered him all around the ring, keeping him on the ropes and in the corners most of the round. Finally, Raul Caiz, Jr. felt he had seen enough and put a halt to the contest at 2:40 of that second round. 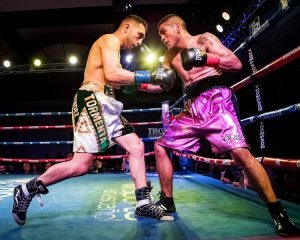 Ruben Torres (3-0, 3 KOs) stood across from Alejandro Zepeda (0-3) in a super featherweight fight that was scheduled to go four rounds. The introductions took longer than this fight did. Torres was all over Zepeda from the bell, and he was relentless with his attack. 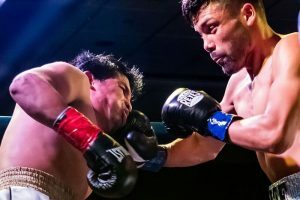 It took a mere .42 seconds to put an end to the contest when it was waved off by referee Raul Caiz, Sr.
Super bantamweights took to the ring when Jonah Flores (2-0) took on Ivan Martino (1-1, 1 KO) in a bout scheduled for four rounds. We saw a lot of action from these two men in the opening two rounds, with each one of them scoring some points, but no one was really rattled during the first half. That changed in the third, as both fighters looked to be trying to end it. They both landed some very good shots, with Flores seeming to get in the better punches. That continued into the final round, but Martino was able to land some really good body shots in the last round. Jonah got in a couple of hard overhand right hands, and appeared to be the more polished fighter. We went to the scorecards. All of the judges had it the same way, 40-36, all for Flores. 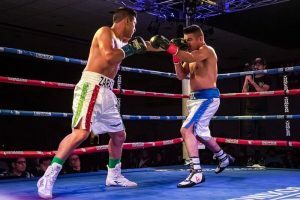 In the opener of the evening, we saw Luis Zarazua (7-0-1, 4 KOs) going up against Luis Silva (4-12, 2 KOs). This fight was scheduled for four rounds in the junior welterweight division. From the opening bell it was all Zarazua, who dropped his opponent after many punishing punches. He got up to continue, but another barrage of punches ended his night at 2:43 of the very first round. With his dominating performance, Luis added another win to his record. Santillan remained undefeated and kept his belt – expect big things from him in the future. Ituarte looked quite dominate this night as well. Zarazua is another fighter to keep an eye on as well. This closing show for Thompson was in some ways a strange one. There were many fights that were very short, a score card mess up that had the wrong corner winning, and the stoppage of the main event that left many wondering why. Still, it was a fun night and we look forward to what is to come in 2018.